Since July, visitors to the Fairfield Public Library have had to enter at the back of the building if they want to check out a book. That’s because the front entrance is getting a new makeover, complete with new automatic glass doors and a remodeled foyer. The construction, which is expected to cost about $230,000, is to begin soon and be completed by December. Library Director John Helle said the new foyer will not only be attractive, but it will get rid of a problem of water leaking through the roof that had gone on for several years. The previous design of the foyer of the library that was constructed in 1984 had a circular brick entryway with a flat roof and a skylight over the entrance that was lower than its surrounding walls. Helle said often collected snow and made the drainage of rainwater difficult. “It was leaking and pieces of plaster were coming down,” he said. The new foyer design is of brown steel and glass. The front entrance of the library will have different shades of glass, some clear, including the entrance’s new automatic doors. The layers of glass above and below the doors are shaded, providing contrast in the design and filtering of the sunlight at the front of the building. Though the previous library entrance was wheelchair accessible, a person had to push open the doors to enter the building. The new entrance will have fully automatic glass doors that will make it easier to enter than before, the director said. Gerard LaSalle, a member of the library’s board of trustees, said the entryway renovations were needed because of the wear and tear on the library, which is more than 20 years old. He said the architectural design of the entrance and structural changes will make the library safer and more attractive for visitors. 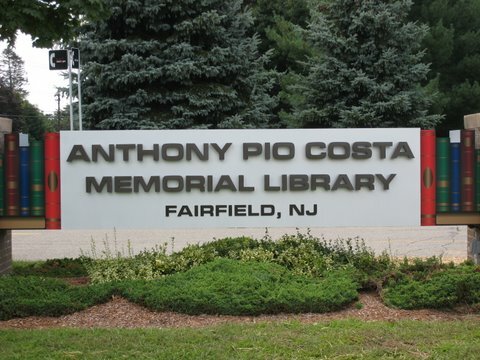 Helle said the library records show each year 40,000 visitors use the Fairfield Library, which is also called the Pio Costa Library, after its founder, Anthony Pio Costa. The cost of the foyer project is being paid by a combination of Community Development Block Grant, an Essex County Improvement Authority loan and money from the library’s annual budget, officials said. Besides the foyer, the library is getting some attention from passersby because of a new illuminated outdoor sign installed at the library, which lights up at night. “It’s going to be a beacon,” said Helle, who showed a photograph of the previous sign with crumbling paint. The lighting on the old sign had been disconnected five years ago because it kept shorting out. 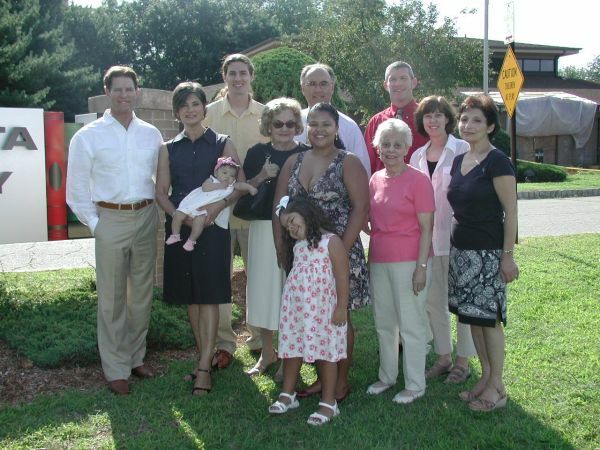 The new sign was donated by Robin Pio Costa-Lahue, the daughter of Anthony Pio Costa, who brought her new granddaughter to the dedication of the sign a few weeks ago. She said she has stayed in close contact with the library staff and told them to let her know when the library needed help with a specific project. LaSalle said the library board has plans for other improvements to the building including a new heating and air conditioning system and a new roof. Eventually, he said the board may reconsider seeking to expand the library. Helle said his next goal is to replace the outdoor post lighting that surrounds the library. Many of the posts have been damaged or knocked down, he said.